Looking for ELD Devices For Sale ? The federal mandate became a final ruling in 2017. Hard Enforcement began in 2018. Truck drivers are now looking for ELD Devices for sale. ELD devices are come in various shapes , sizes and formats. The devices have different features and capabilities. The device manufactures range from small firms to industry giants. Lets try to make sense of the enormous amount of information. Originally, many high tech companies promoted ELD devices under the term E-LOGS. Those were On-Board Electronic Recorders(AOBRDS) that uses outdated technology. According to the FMCSA, AOBRDS and ELDS have different technical specifications. The primary issue with the outdated electronic loggers is the lack of connection with the engine’s computer. Further, those units depend on the driver to manually enter duty modes, and locations. In addition, those units cannot send the information via current technology such as wireless networks and Bluetooth. Those devices will be phased out by December 2019. The market is flooded with ELD Devices for sale. However, only certain devices meet the Federal Motor Carrier’s strict guidelines. There are few elements that are vital. The first and most important element is the ability of the ELD device to connect to the vehicle’s computer. Second, the device must be able to send the stored data via new technology(wireless/Bluetooth). Finally, the device must display the data in graphic format. In order to determine which ELD devices are currently compliant, a checklist must be used. The larger ELD manufacturers are Garmin, Keep Truckin’ , JJ Keller, Linxup, Omnitracts. There many new comers entering the ELD market every day. A complete list of approved ELD Manufactures can be found on the Federal Motor Carrier Agency’s website. There are many great things about the Keep Truckin ELD. However, the most attractive quality, though, is its price. In addition to that, the device is super user friendly. The Keep Truckin ELD device offers monthly pricing like most ELD units. Therefore, you might be waiting for us to tell you about the upfront cost of the product. The great news is there is none! Keep Truckin ELD can be considered the Easiest ELD in the world: provides a very easy, modern and simple app. The app allows editing of drivers logs. Furthermore, the driver may change the duty status easily. Some of my drivers are still using their old keep truckin app. I been told by some drivers that using the old app without an ELD device connected to the truck will allow drivers to cheat on their electronic log. In other words, the driver will be able to change the past duty status even for driving. Nowadays, this app would be label as eld device cheating. When drivers tell me about the possible keep trucking eld cheat, i laugh. It is very funny because Keep Truckin published a ELD cheat sheet on how to avoid ELD violations. The DOT inspection mode in the app is very easy to use out of all of the eld devices. The driver is able to show the log history information to dot enforcement officers in a matter of seconds. If a driver were to get in an accident, they would need to take pictures. Keeping this need in mind, KeepTruckin has assured that drivers can use ELD Devices to take pictures. Those pictures would be of accident sites or other situation where a picture would help the driver with insurance claim. They can even send the pictures to dispatch through the app. In addition to the the standard features provided by every company, KeepTruckin has added some advanced features to the ELD devices menu. For example, geofencing, fuel monitoring, tampering alerts and engine diagnostics. Already satisfies ELD mandate: while most companies claim that they will satisfy the mandate before the due date, it is important to note that KeepTruckin has already satisfied it. A company well known for its focus in GPS tracking, navigation, data recording, and data sharing technology. Furthermore, Garmin is at the lead of the pack when it comes to creating integrated, high quality ELD devices. The Garmin eLog™ will fit any standard 6 or 9 pin data port. Installation is simple, and it begins working as soon as you plug it in. Besides the eLog™ being compatible with a range of other Garmin devices, the proprietary software also allows you to connect your eLog™ system to a GPS enabled tablet or smartphone. The device is designed to last. The 2.5 oz. cylindrical device is comes in a sleek black outer shell. The device data is accessible both from USB and through Bluetooth for quick sharing. As per FMSCA mandate, the Garmin stores information regularly at different intervals. The times-sheets and data sets meet the formats specified by the FMSCA. These time-sheets are available to safety officials and administrators via USB and Bluetooth. However, presenting the data via time-sheet on the smartphone app is sufficient for satisfying safety officer’s viewing requirements. Since most of the information is recorded automatically (engine start time, driving timesheets, resting periods, and engine/vehicle data), that’s less work for the driver, and overall less time spent with safety officials and more time getting things done. While this ELD meets every FMSCA mandate, it does not go much further than that. Of course, the device supplies a variety of manuals and tools to help you learn to use it, but it does not have much training material. Also, since this is a relatively new product, some software features are still forthcoming, such as Driver Vehicle Inspection Reporting and International Fuel (DVIR) Tax Agreement (IFTA) reports. On the bright side, when these features become available, they will be extremely useful, but they are not quite there yet. Another supposed disadvantage is the customer service hours. Garmin offers customer product support hours weekdays from 7 a.m. to 7 p.m., rather than 24 hour paid customer support that other ELD providers offer. Another thing the Garmin glaringly lacks is compatibility with Fleet Management System (FMS) software, or its own proprietary fleet management software. Now, that is okay if you are an individual contractor or if you company does not use FMS; it still meets every FMSCA requirements. However, this could be an issue if your company requires closer tracking, auto-syncing over Wi-Fi/4G with company systems, constant GPS reports. A final issue with the eLog™ is that Garmin seems a little unclear about some of the technical specifications. For example, memory and data storage. Further, nowhere under the specifications under the product description on their website does Garmin specify how much storage space the eLog™ has. In addition,it does not mention how long each report and timesheet is stored on the eLog™ device for. Rather ,it is assumed that timesheets and data are available online and through the app for long enough duration for the driver to supply timesheets to employers within the required 13 day period, as specified in the mandate. For this reason as well other reasons, the hGarmin eLog ELD meets and exceeds all standards set by the FMSCA. The Stoneridge EZ ELD has all the bells and whistles. Capable of storing up to six months of data (and immediately accessible to law enforcement for up to eight days of data), it’s clear that the EZ is focused on quality and technical capabilities. The device itself comes with nearly everything that the eLog™ does. While the eLog™ focused on driver satisfaction, usability, and cross-platform functions, the EZ ELD goes a step further. Unlike other ELD devices, it provides full integration with Stoneridge FMS software. This means that so long as you have a data or internet connection, all data can be continually sent, stored, and analyzed in a “back office” computer. Besides that, the device itself looks more or less the same—a small black encasement with a red ring around the edge, rather than a blue. However, the EZ comes with more connecting capability, offering in package a selection of all the adapters you can need. While Garmin is a huge company that focuses on a wide variety of services, Stoneridge is a little more focused when it comes to CMV equipment and fleet management. This means that Stoneridge is aware of the needs of not only the driver, but the company as a whole. This is why Stoneridge makes it easier for management to access, copy, store, and modify data as need. It also means that back office teams are to send working logs directly to each device, assuming that the devices are connected to the internet via the Android/Apple app. As for the app, it is also fully functional and capable of storing, distributing, and viewing files for up to six months, and viewing timesheet calendars for up to 30 days at a time. Stoneridge’s online resources are also a bit more extensive, with more training materials, manuals, and FAQ’s than was available on the Garmin site. Stoneridge also claims to offer free training, which is worth taking advantage of, although they also claim that their products are extremely easy to use and require very little training. Besides that, Stoneridge is also further ahead where reporting is concerned; they offer free Driver Vehicle Inspection (DVI) and International Fuel Tax Agreement (IFTA) reporting as part of the package, and it’s already available. As a whole, Stoneridge offers tons more features than the Garmin—the EZ ELD is a product streamlined to service an entire company. Perhaps best of all is that the ELD device itself only costs $169 dollars—but that’s not the only cost. While Stoneridge claims there are “No hidden costs,” they do make it loud and clear what other costs exist. The ability to use the proprietary software requires a monthly subscription of 15 dollars (discount offered for yearly subscription). While the software still will likely save your company costs in man-hours it would normally take to fill forms, submit documents, and exchange information, the is still high compared to the Garmin. With the Garmin, you only need to make a one-time purchase, which includes all the software and data needed to comply with new mandates. Over a three-year period, you will pay up to $370 more per driver for the Stoneridge than the Garmin. However, when accounting for the costs saved in man hours and reporting, it’s up to each fleet to determine if the cost will reap benefits. The most suitable ELD out there for smaller fleet. The bit eld is one of only few eld devices that come with no monthly costs / ongoing subscription. Unlike the other no monthly cost providers, the bit eld has many advanced features. Furthermore, this simple product is definitely one to try out if you’re looking for value. It gets the job done and just because it doesn’t come with as many advanced features as all the others above, doesn’t make it any less capable. For the low upfront price is $295, However since it comes with no monthly cost --it can’t get any better. There are many pros of the ELD are listed below. The installation takes no time since it is a simple plug-and-play basically. All you have to do is plug the dongle straight into the vehicle’s diagnostic port, and that's it. After that, you connect your phone to the device via Bluetooth. While there are many companies that haven’t yet satisfied the ELD mandate but claim that they will do so before the due date, BIT ELD offers the full and simple ELD mandate compliance without any extra features. While the current BIT ELD is simple and only has the base features, updates are planned to improve it in the future. These include IFTA mileage tracking and a more detailed every-minute GPStracking and history. Since the BIT ELD offer base functions, it is ideal for smaller fleets. Those don’t require as many advanced functions. Those are more than happy to spend so little and receive everything they need in return. The Rand McNally ELD 50 has a seemingly unlimited number of features. However, you will never know how much these features cost, because Rand McNally is very vague about pricing for subscriptions or software beyond the price of the ELD itself. The benefits of this ELD device include the ease of installation, and the software. This device costs only $149.99, making it a little bit cheaper than Stoneridge’s device. In addition, it requires a monthly subscription. Beyond the standard mandated capabilities, the ELD 50 is also capable of generation advanced DVIR reports and stores immense amounts information on the metrics and functions of the vehicle. Some of the data it measures and stores can be useful and cost effective, such as fuel efficiency readings and fluids. The sales webpage describes all of the available features for this device. In fine print, it mentions that all of these features are only available once you purchase the subscription to DriverConnect web portal. You can only access the web portal only after you have purchased, installed, and registered the ELD 50 with an android device. Only once all that is set up can you purchase the web service, making the cost of the subscription a mystery until then. However, fleets and business are able to contact Rand McNally for quotes and product demonstrations for the proprietary fleet management software and service, but it makes it a little worrisome that Rand is less up-front about the cost of the services they provide. This service seems more fleet-centered than driver-centered. The ELD device itself is relatively easy to install. However, it can only hold up to one day’s worth of data at a time, compared to EZ ELD’s six-month data storage capability. This means that Rand McNally’s ELD 50® relies completely on the software subscription to function. Also, if android phone does not connect within that one-day window, then the data does not back up and earlier data is deleted. This can present difficult situations if the driver were ever to lose his phone or android device. On the bright side, if a subscription is purchased, the online portal supplies storage for all data, timesheets, and metrics, making up to 6 months’ worth readily available from any android device. If you’re interested in having a full package of GPS system and tracking, integrated data plan, certified ELD device with automated IFTA reporting, and backend fleet management resources, then maybe LINXUP ELD is the best option for you. LINXUP differs from other carriers in several important ways. For one, they are not BYOD—bring your own device. This means that rather than relying on the drivers to supply their own Android or Apple devices to sync and share information with the ELD, it is necessary to also purchase the LINXUP proprietary tablet. LINXUP claims that by requiring the device to include a tablet can lower compliance risks and increase profits. With BYOD systems, normally your driver brings his/her own cellphone or tablet to record ELD information and access timesheets and RODS. In this situation, what happens if your driver forgets to pay a cellphone bill? This could mean late data, lost GPS information, and more hassle. The integrated package brings the responsibility back to the administrator’s hands, allowing them certainty that you will always be able to receive your needed data. The ELD device costs about $149.99, competing easily with the Rand McNally ELD. The GPS tablet costs $149.99 as well, bringing the total equipment cost to about $300—quite a bit more than any of the other providers so far. After you’ve purchased the equipment, you must then purchase a monthly plan. LINXUP has three options. The first $29.99/month plan, which handles all of the basic mandates, allowing drivers to share information, timesheets, vehicle data and metrics, etc. The second plan, at $39.99, offers GPS services and tracking services, but also gives the user or fleet the ability to harness backend software for additional fleet management services. The third option, costing $49.99 per vehicle, is premium, offering all the previous features plus IFTA automated reporting services. Compared to Konexial, Rand, Stoneridge, and Garmin, LINXUP has the most expensive plan. The most basic plan costs more than twice the price of Stoneridge’s premium plan; Stoneridge offers IFTA and DVIR reporting for half the price, as well as full back office fleet management services. Konexial also has premium services, but again, their premium service coasts $20 less per month than LINXUP. Minus the cost of equipment, LINXUP will cost about $600 per year per vehicle for their premium service. However, while you are paying more through LINXUP, you are still paying significantly less per year than some of the most expensive services. And while you are paying more, LINXUP still has something more to offer; you are paying for one of the best and most experienced companies in the GPS tracking business. LINXUP focuses on creating products that offer a high level of security for their clients. With the integrated ELD and GPS system, you can be certain that you will always know exactly where your resources and shipments are. Their integrated system increases efficiency by reducing the possibility for driver-related data transmission error, while placing less burdens of responsibility on the driver. This allows the driver to focus more on what’s most important. So, if you own a fleet or business that requires great tracking, GPS, and security need, or if you ship high-risk or expensive materials, then perhaps LINXUP is your best option. Magellan has taken a unique approach to their ELD’s by partnering with another company, Samsung, to create integrated systems similar to LINXUP systems. 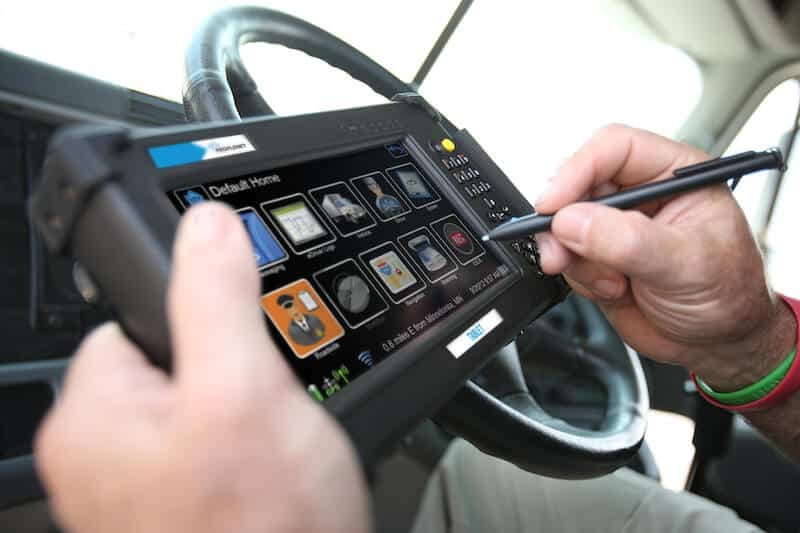 Magellan’s systems use a Samsung Tablet, connected securely to the ELD, in basically the same way that LINXUP does with their tablet/GPS and ELD. However, Magellan also offers BYOD capabilities—something that LINXUP does not do—so long as the device you’re using is Samsung. In their product description for the eLog, Magellan is not clear where or how you can download the application used with the ELD, nor do keep a list of devices that are compatible with the device. Magellan does make it clear that you can order a Samsung galaxy device (either tablets or smartphone) with all of the software pre-installed, which could be convenient depending on your needs. Additionally, Magellan’s ELD is accessible by Bluetooth, Wi-Fi, phone, and USB, making certain that your ELD is accessible in any situation. Magellan, like so many other ELD providers, claim to have the lowest costing ELD device and software. According to their website, the ELD currently sells at a discounted rate of approximately $120 (or $150, which includes DVIR and IFTA reporting), which is a lot cheaper than any of the other devices here, save for the My20 by Konexial. However, what makes Magellan cheaper than Konexial in this case is that there is no subscription fee for the first whole year of service. After that, the service fee is only $10 per month—cheaper even than Stoneridge’s $15 per month. This $10 per month service also includes both back office fleet management software as well all mandated driver software and necessities. In addition, unlike Stoneridge, LINXUP, and so many other providers, Magellan also offers a range of other fleet management solutions, from separate fleet navigation systems to proprietary GPS displays, each capable of working with back-office software as well. If you think that ELD device is super expensive, then don’t worry about it. All ELDs aren’t as expensive as you think they are, that’s just a huge misconception. The older already existing ELD devices were expensive. However, due to new technology the new devices are much more affordable. Instead, many ELD manufacturers have now started to offer their product at economical packages. They do that to make them more affordable and easier to buy for their customers. one of ELD devices can help lower your crash rates. It helps save all the time you would otherwise have spent organizing logs. Once you think about all these benefits and more, you’ll realize that an ELD device is definitely worth the price! According to the Federal Motor Carrier Safety Administration’s new rule, all truckers need to make use of ELD devices. Further, the driver cannot use any ELD device as he/she pleases. The FMCSA has a list of all registered ELD devices, and the driver must choose an ELD from this list. The easy way to ensure compliance is to review the mandate’s specifications. Those specs are publicly available. Another very important thing to find out is : whether or not the ELD device is synchronizing with the engine data. It is paramount to check with the manufacturer about the ELD and what you can expect from it. Most of the famous ELD devices already satisfy the mandate. All those that don’t satisfy it claim that they will release software updates before the mandate’s compliance date, i.e., Dec. 18, 2017, and these updates will satisfy the mandate without requiring any new-hardware purchases. If you’re not willing to buy an ELD device, then there’s a simple solution. One can turn your phone into a compliant ELD. But don’t get too excited just as yet. Many people believe that a smartphone can be and ELD Device. A smartphone all on its own isn’t enough to replace an ELD device. Yes, it’s true that a smartphone may serve as an ELD device. However, a connection with the truck engine is paramount. A ELD device is important addition. Finally, a smartphone by itself is not a substitute for any of the ELD devices. According to the ELD mandate, an ELD must directly connect to the truck’s diagnostic port. Unfortunately, smart phones are not directly connecting to the port. Therefore, smartphones are not passing for functional ELDs by themselves. If you really do want to use your phone, you’ll have to spend some serious money. The expensive hardware will attach the Smartphone directly with the truck’s diagnostic port. Buying anyone of the ELD devices is less expensive. Simply think of it as an investment because it will surely help you a lot in the longer run.